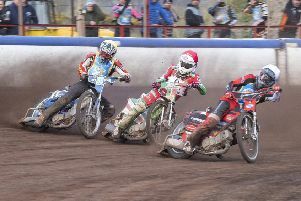 Edinburgh Monarchs came in from the cold on a wintry evening at Berwick Bandits on Saturday to rescue their ailing speedway League Cup qualifying hopes. After Berwick had stunned Monarchs by winning at Armadale ten days ago the border side were warm favourites to complete a double over Monarchs, but the battling Capital side turned the tables on their hosts to triumph 48-42. And while they gained three match points instead of the four they craved, Monarchs, the holders, are still in the competition, albeit by the skin of their teeth. Glasgow Tigers boosted their chances of making the semi-finals by beating Berwick yesterday at Ashfield 49-41. Monarchs were looking for their top four to step up a gear and this they did in great style, in fact Monarchs provided an incredible 12 race winners over the course of the match which stunned Berwick who may not be as solid as they think. Monarchs’ rampant American Ryan Fisher collected a paid 15-point maximum and received sterling support from skipper Sam Masters and Kevin Wolbert who also both weighed in with double figure totals. Erik Riss should not be overlooked either, the young German scored a valuable eight points which included victories in his last two outings. And reserve Dan Bewley picked up an excellent second place in heat two by keeping his Berwick counterpart Liam Carr in third place as the Bandits countered the 4-2 Monarchs produced in the opening race. Bewley’s bike packed up after that and the teenager had to switch to his second machine which proved less effective. Monarchs were on course to plunder all four points when they led 43-35 after heat 13, however the Bandits snatched a 5-1 in the very next race to cut Monarchs’ lead in half. And although Monarchs grabbed a 4-2 in the final heat, their six-point victory just fell short of the margin required to claim the magic four meeting points. In reality Monarchs are far more focused now on their opening Premier League fixture against Workington Comets on Friday, the cup is secondary to that. Berwick: Pijper 12, Doolan 8, Wethers 7, Alden 5, Carr 6, Jorgensen 4. Monarchs: Fisher 14, Masters 12, Wolbert 10, Riss 8, Bewley 2, Etheridge 1, Clegg 1.